For an affordable laser printer, the Konica Minolta Magicolor 2500w delivers superb quality output. This printer is ideal for personal and home use. Users can expect high-quality and crisp text documents plus vibrant coloured graphics. The Konica Minolta Magicolor 2500w has a high duty cycle of 35,000 pages per month. It also offers optional Ethernet for convenience of workgroups. The Konica Minolta Magicolor 2500w does not have an automatic duplexer and also has low paper handling capacity. 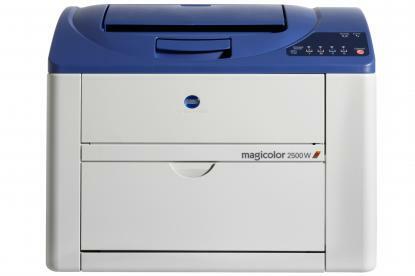 The Magicolor 2500W colour laser printer has a maximum resolution of 200 x 600 dpi. Print speeds can go as fast as 20 ppm for monochrome prints and 5 ppm for coloured prints. For connectivity, there is a USB port at the back. The Konica Minolta Magicolor 2500w printer is compact and desktop friendly; it weighs 23.7 kg and has dimensions of 430 x 395 x 341. The paper tray can handle 200 sheets, and the control panel with indicator lights is located beside the output tray. The Konica Minolta 2500w is one of the most affordable laser printers in the market yet it does not compromise its quality. Prints are of excellent quality from black and white to coloured. For workgroups, optional Ethernet is available. The Konica Minolta Magicolor 2500w colour laser printer lacks an automatic duplexer for easy double-sided printing, but manual duplexing is supported. Print speeds are rather slow and paper handling capacity is also limted with the Magicolor 2500w laser printer.